Having the correct snack food moisture level has become a critical component during the various stages of baking. The snack food product can easily become either too wet or too dry, wasting manufacturer’s time or money as well as impacting the quality of the end product. 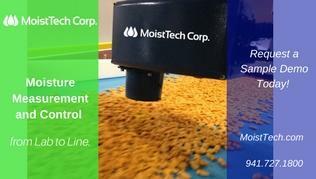 With the help of industry partners and 40 years of knowledge, MoistTech has developed the IR-3000 moisture sensor that is ideally suited to measure the snack food moisture levels during the baking process. The sensor is coated in a food grade Teflon with a polymeric viewing window enabling manufacturers to improve product quality without any contamination. Snack Food Moisture Sensor Installation - By installing the MoistTech snack food moisture sensor at the exit of the ovens, close to packaging, will allow the snack food time to stabilize while cooling. Ideally, a minute after the ovens. The sensor should be installed several inches above the belt or screw conveyor so that a baker can continuously monitor the process and can control the moisture content either manually or automatically in the finished product. If the snacks have gone through an oil spray, it is important to install the sensor at an angle to cut down any reflectant from the oil coating. Environment - If the sensor has to be installed close to the oven outlet where it will be susceptible to extreme heat conditions, it is necessary to cool the sensor with either air or water. Furthermore, if the sensor is located near an oil spray, it is necessary to clean the sensor’s optical window during regular routine cleaning. MoistTech is very experienced with the requirements in the production of snack foods. Our sensor calibrations, measurement wavelengths, algorithms and sensor optical requirements are pre-set at the factory. Typical accuracy is about ±0.1% moisture. Typical analog range is 0-10% moisture. The outputs can be adjusted to optimize PLC or recording requirements. For additional information or to discuss your application, please contact our headquarters.